The Commuter is 'Non-Stop' but on a train. That sentence alone, is how everyone will describe this film. Why? Well, because it is. It's the exact same formula (with the additions of a few twists) that descends into a messy and coincidental plot. Yet, much like the other Collet-Serra and Neeson offerings, it's undeniably enjoyable. A commuter is having a bad day, and now it's about to get even worse. He must identify a passenger that "does not belong", once he does he will acquire $100,000. If not completed in the allotted time, well...there will be consequences. This is probably the weakest thriller that two have created together but come on...the entertainment value is too good to pass up. It details a man who has hit rock bottom, where salvaging for any money gaining opportunities is the only thing left. What would you do in that situation? The film actually explores that, both practically and hypothetically. That's pretty much the extent of the narrative. 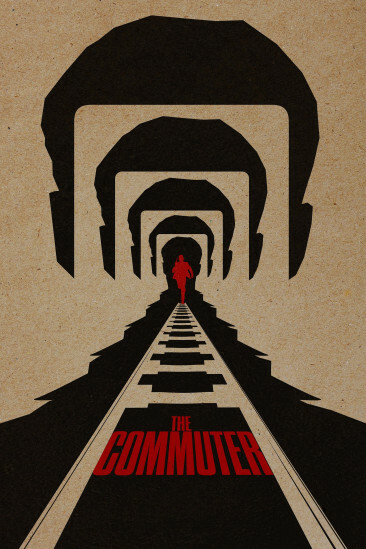 It's Neeson, walking up and down a train, judging people, investigating bags and somehow packing more action than the average thriller. These confined locations are always put to good use in getting to know the supporting characters, heck Agatha Christie knew this best. The hand combat sequences were filmed fine, however one or two scenes actually stood out. The one take fight sequence involving an axe was very effective and heightened the thrills the film desired. Collet-Serra's visual flair enhanced the aesthetic appeal, particularly the beginning where we watch the same scenario but on different days (obviously to highlight the fact he wakes up, reads with his kid and commutes to work). Neeson is dependable as ever. But, the third act goes from first to sixth gear instantly, to which I was not prepared. It's downright ludicrous and the messy execution became a detriment unfortunately. I found the twists slightly predictable and underusing Farmiga was a crime! However it's an enjoyable flick, time flew by in what was a well paced messy familiar thriller. I want Neeson on a bus next. No wait, a blimp!